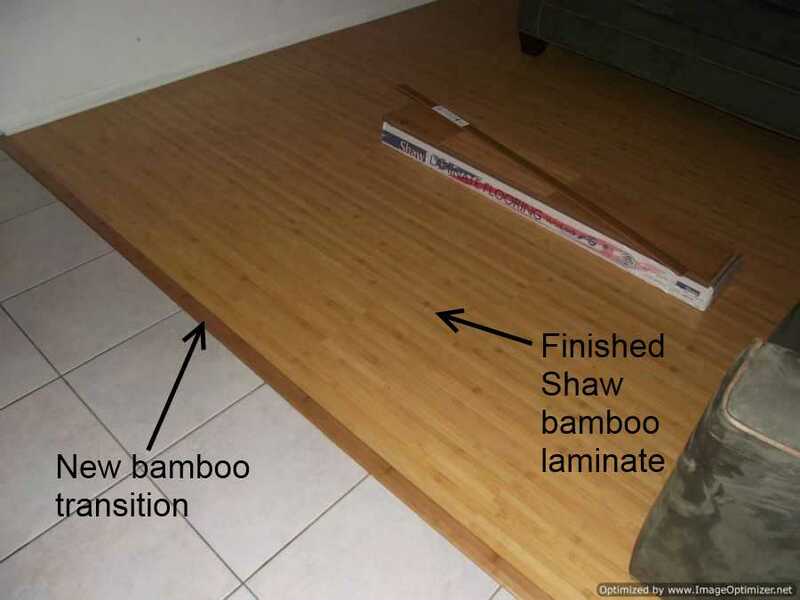 This is my Shaw bamboo laminate review based on me installing some today. This Shaw product is 8MM thick. The style is Natural Impact II. The color is Golden Bamboo. The locking system is called VersaLock. Warranty is 20 years, although I have seen it listed on some sites as 25 year warranty. The job I did was one room. I have to admit I was glad that it wasn't a whole house. This was actually a replacement due to a burn in one of the planks. The homeowner didn't have any left over planks from the original installation. This locking system was not installer friendly at least for me. I couldn't tap the end joints together while the planks were flat. Some locking systems allow you to do this. Their directions say to connect the end joints first in a row, it says to connect about three or four planks. Next it says to go back and tilt the first plank up and connect the side joint, put some weight on it and continue down that row. And to use a small block of a 2X4 to tap them together without a hammer. This is a lot easier said than done. Does this make since to you? I'm reading this off the directions that came inside the box. I had to connect the whole row of end joints and then tilt it up starting at one end and work towards the other. Luckily it was just a square room. If I had doorways and hallways this would have been a nightmare. Another thing that bugged me was the locking system would break off easy. If I had to disconnect a plank some of it wold fall off. So after writing this Shaw bamboo laminate review, I would not recommend this laminate for a do it yourselfer. Mainly because of the difficulty of the locking system. A square room with no doorways may be OK. But if your going to install this product down a hallway you will have a steep learning curve. I have to admit, it did look nice when finished. When replacing the floor the previous installer had glued everything together at the ceramic tile. 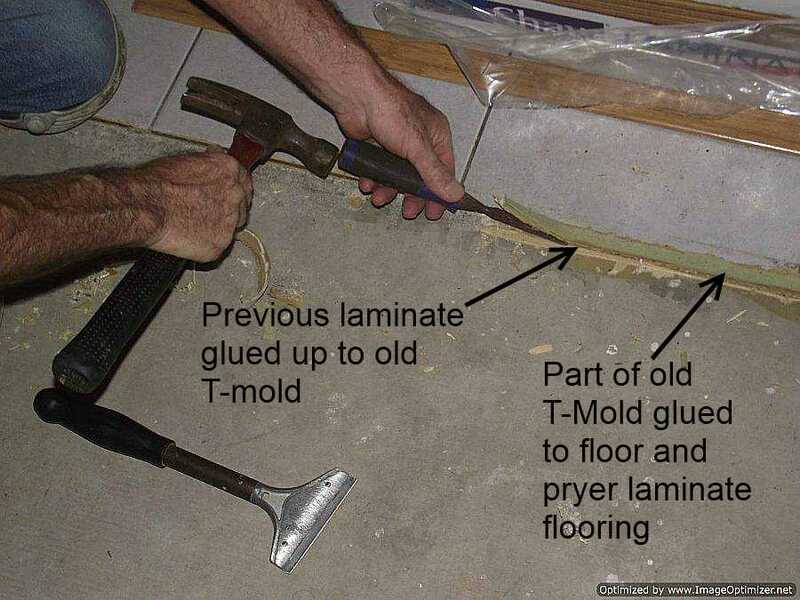 This included the laminate being glued to the T-mold. I had to use a chisel and hammer to take it up, while being careful not to damage the ceramic tile. You just can't do this, it will cause the floor to buckle over time as it expands. 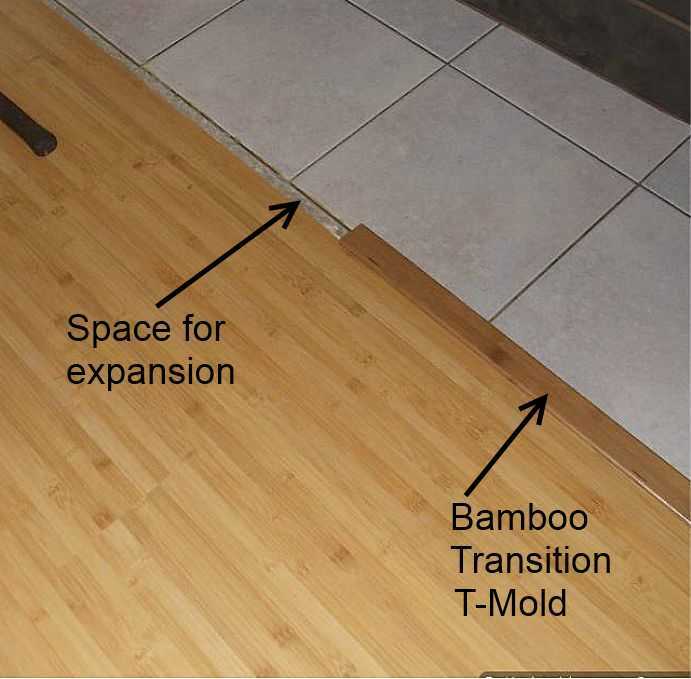 In this photo you can see where I'm installing the new bamboo T-mold. I leave space between the bottom of the T-mold and the laminate flooring. These T-molds were made of actual bamboo and cost 30.00 each. I glued them on with construction adhesive on the tile side and Pergo sealant on the laminate side. 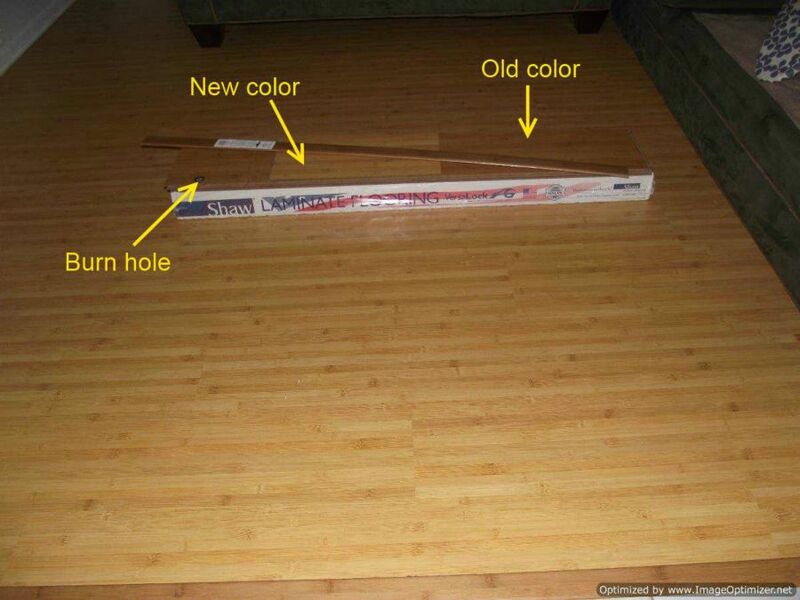 I do it this way so if the floor expands, the sealant is flexible and allows it to move a little bit. Sometimes you may need blue painters tape to hold the transition in place until the glue dries.